Give the Love birds a personalized gift they'll forever cherish! 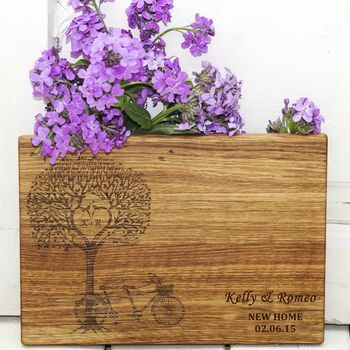 This handcrafted, hardwood cutting board is destined to become a true family keepsake. It's an ideal and sentimental gift for weddings, anniversaries, Valentines day, housewarmings, and more. 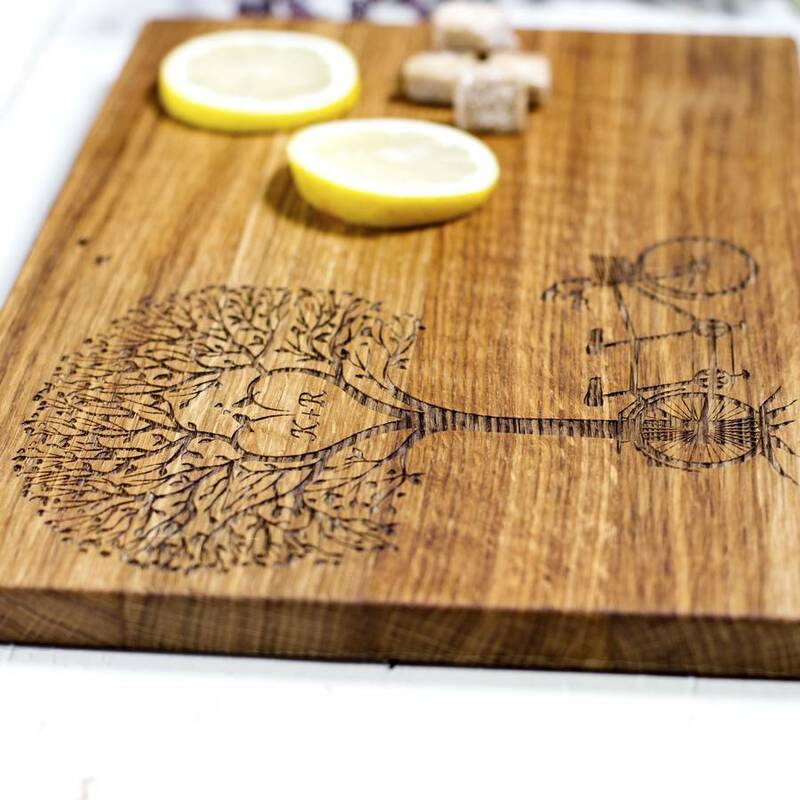 This playful and personalised cutting board is perfect for food preparation, serving cheese and appetizers or as a kitchen accessory. The front is personalised for displaying on your counter while the back is left plain for chopping. 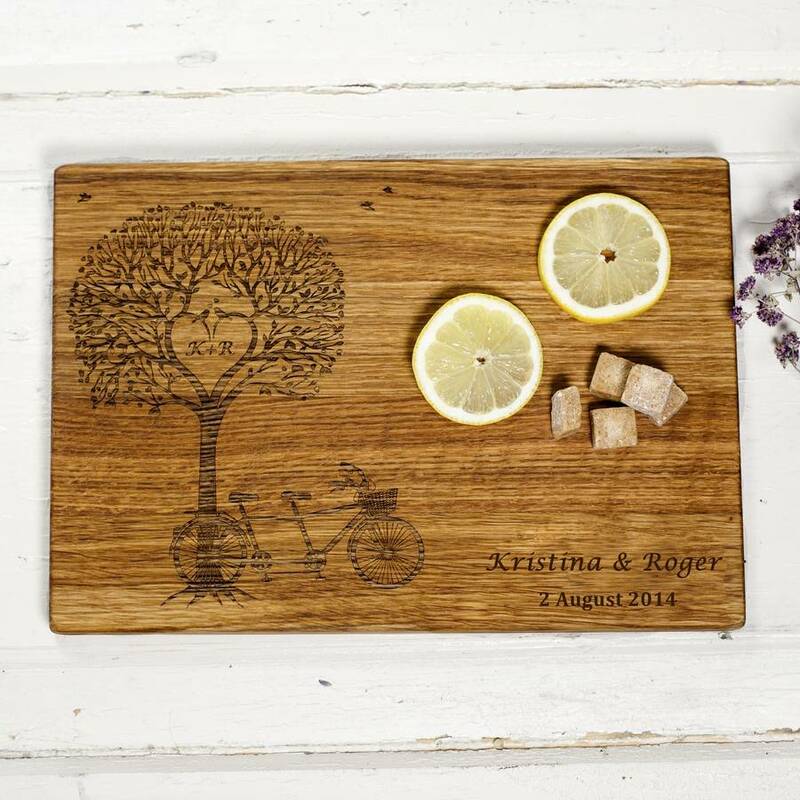 The chopping board will be personalised as in the photo shown with a names and date. Please take care when entering your personalisation as it will be engraved exactly as you enter it. NOTE: Hardwoods provide a wonderful selection of grain patterns, colour variations, and textures, The cutting boards crafted from hardwood will have variations in colour and grain in each strip used to create the cutting board. Because no two trees are exactly alike the colour of the wood strips within the cutting board may vary from light to dark. The picture and letters might be darker or lighter than in the picture shown. Therefore every board is unique and inevitably they differ slightly in terms of finish and appearance. Simple Care Instructions: The chopping board can be washed by hands using warm water and a small amount of detergent; avoid soaking. It is recommended to treat the cutting board with nutritional oil using a sponge. PLEASE check the DELIVERY DATE BEFORE you make your purchases on personalised items. Please note - if you send us your personalisation details then decide to CANCEL the order AFTER your order was CONFIRMED & PROCCESED, we CANNOT refund or cancel your order. Delivery time 10-14 WORKING days. Oak wood from EU sustained forest. This product is dispatched to you by Natural Gift Store.